Florida Poly President Dr. Randy K. Avent kicked off the event with a brief overview of the state of the University and its commitment to the application of STEM education in the economic development of the region. He then introduced the plenary session and keynote speaker, Dianne Gutierrez-Scaccetti, executive director and CEO of Florida’s Turnpike Enterprise, the developer of SUNTRAX. [link to slides]. Oral Testimony of Dr. Randy Avent. Senate Committee on Commerce, Science and Transportation Field Hearing. January 24, 2018, 10:00 a.m. Walter E. Washington Convention Center Washington, D.C.
Link to written testimony here. 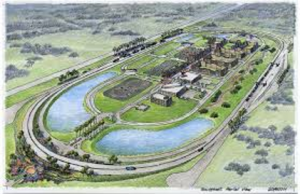 Tallahassee – Florida Department of Transportation (FDOT) Secretary Jim Boxold announced a long-term partnership between FDOT and Florida Polytechnic University to construct the new, state-of-the-art transportation technology testing facility, SunTrax. 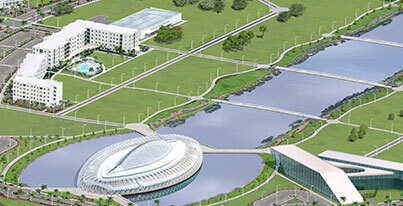 The creation of this facility will establish Florida as a transportation technology leader and create a high-tech hub for the research, development and testing of emerging transportation technologies related to tolling, intelligent transportation systems (ITS) and automated and connected vehicles. For more information visit Florida Trend here. For more information on Suntrax. It’s tempting to overlook agriculture when discussing AV technology. But there are more applications than you might believe. Commercial drones are already in place, using sensors to assess the need for fertilization, irrigation, crop health, crop maturity and productivity potential. On the horizon are robots capable of monitoring, cultivating and harvesting crops 24/7, with little or no human labor involvement. In the short term, sensors and automation hold promise for Florida agricultural industries long dependent upon troublesome labor politics and economics.AV-related technology will allow surveying, planting, maintaining and harvesting of crops at levels of efficiency never before seen. Just a few years ago, the conventional wisdom was that such a device could never be developed. However, advances in sensor sensitivity and data processing speed (Nvidia’s processor crunches 30 gigabytes of data per second), coupled with GPS and “stereo vision” have enabled the creation of a robotic picker that can harvest strawberries day or night. After three years of testing on rails, the robotic picker is ready to deploy on wheels in strawberry fields this season. And it is not the only game in town. Other initiatives, such as a robotic picker developed by Agrobot – are promising to transform the industry. Benefits to growers include lower harvesting costs, improved harvest quality, energy savings (berries can be picked at night and need less cooling), 30 percent reduced plastic usage and increased yields of at least 10 percent. The robot can also be used to scout fields for pests and measure more accurate yields. Gary indicated that the biggest barrier to the development of this device has been money and overcoming resistance to the “it can’t be done” mentality. Florida Poly’s critical role as the connector and enabler of this technology for Florida agriculture was clear. This is a university located in the center of a vital agricultural area. There is a future for the continuous development of technology that will increase agricultural quality and reduce costs of production. Is anyone doing or even advocating any minimum level testing? Governments: Creating Test Cases – State and Local governments are waiting on the Fed’s in DoT. Who are clearly doing very little. A couple of weeks ago the GAO completed an audit of the DoT. The GAO stated that the DoT should be far more organized and actually have a plan moving forward. 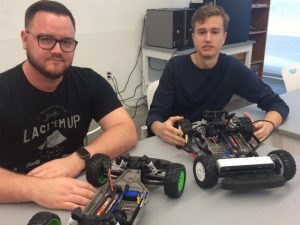 They stated they should also test AVs for minimum capabilities. The DoT’s response was that they cannot put a plan in place or even create the tests until the various technologies involved are settled. The reason it is not possible to create an autonomous vehicle using that process is that it will take one trillion miles at a cost of over $300B. And those using it will cause thousands of accidents, injuries and casualties when they move from benign scenarios to complex, dangerous and accident scenarios. Self-propelled cars could change the world as we know it, says Rahul Razdan, a PhD in computer science. Razdan commented on the issue at a seminar organized by the Engineering Association of Iceland today. Razdan has worked for the creation of launch companies for decades, currently working at the Florida University of Technology. He says the average utilization of passenger cars is only about 5% today.